In my small career as a freelance web designer, I have discovered that I miss a few things about working for a company and on the top of the list is the company holiday party or getting invited to customer parties. Of all the places that I have worked Boston University gave the best holiday party and Kilroy comes in second. Yesterday afternoon, I was over at Alex’s working with Mr. Hernandez on the promo for the New Year’s Eve New Wave Prom with Flock of Goo Goo and the Alex’s Bar 4th / Barflies.net 5th Anniversary party at the end of Jan (more to come on this event). Towards the early evening, Alex asked me if I was going to the Quiksilver party, next thing I know we were planning to go to the party. The Quiksilver party was held at a large two-story tilt-up empty warehouse on the west side of the Orange County airport. Even though we got there close to the start of the party, we had to park a good 1/2 mile away. The inside of the huge warehouse building was decorated in 60’s hipster winter wonderland with multiple bars, food stations, low lounging furniture, large screens hung from the ceiling with looped winter snow scenes playing, a big dance floor, and best of all a photo booth. 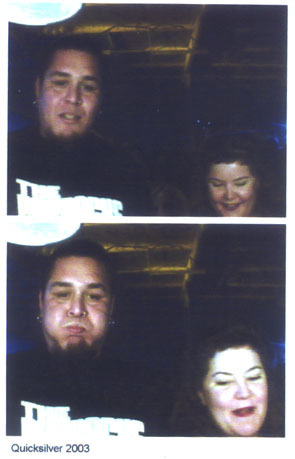 As evidenced from the photos above, trying to work a newfangled digital photo booth after a couple of cocktails had us both confused. I had expected the party to be mostly surfer dudes and chicks, but the crowd was all ages and of many different sub-cultures. The people watching was too good, I kept getting distracted from conversations. The DJs played a fun mix, the first band Moving Units was an odd mix of 80s new wave with hipster emo-indie, I don’t remember Ima Robot, but we left just as Modest Mouse was being announced. All in all, it was a good party and it was good fun to see who one would run into. by Ms. Jen on Sat December 20, 2003 | Permalink | fun stuff.